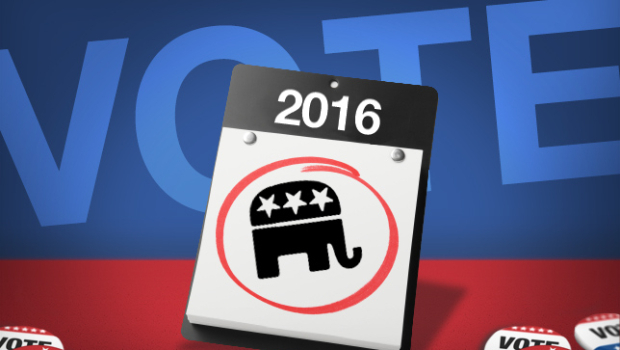 Only 10 candidates in the GOP's first 2016 presidential primary debate? Only ten Republican candidates could make the cut for the first GOP presidential primary debate of the 2016 campaign, the host of the event, Fox News, announced Wednesday. The debate, which will be held August 6, 2015 in Cleveland, Ohio, is being organized by Fox and Facebook along with the Ohio Republican Party. The top ten candidates will be selected by their average in the "five most recent national polls, as recognized by FOX News leading up to August 4th at 5 PM/ET," according to a release from Fox. If any candidates are tied in the polling average, there could be more than 10 contenders onstage. Candidates must also meet the constitutional requirements, file papers with the Federal Election Commission paperwork, and pay the necessary federal and state filing fees to qualify. Fox News' Bret Baier, Megyn Kelly, and Chris Wallace will moderate. The second debate, which will be hosted by CNN on September 16, 2015 at the Ronald Reagan Presidential Library in California, will be divided into two parts, CNN announced Wednesday. The first half will feature only the top 10 candidates "according to public polling," according to a release from CNN and the library. The second half will allow any candidate who exceeds one percent in polls to participate. Given the potential size of the GOP's 2016 bullpen -- no fewer than 16 or people have declared a run or expressed interest in one -- the decision to limit the number of candidates onstage will likely rankle some of those left offstage. As the first debate of the season, it's likely to draw a big audience, and a scrappy performance at an event like this has elevated more than one obscure candidate in the past. Republican National Committee chair Reince Priebus stood behind the decision to limit the number of debaters in a statement. "We support and respect the decision Fox News has made which will match the greatest number of candidates we have ever had on a debate stage," he said. In the aftermath of the GOP's loss in the 2012 presidential race, Priebus vowed to bring the GOP's debating process under tighter control, criticizing roughly two dozen-plus debates Republicans had in the 2012 cycle as "ridiculous" and an "embarrassment." "It hurt because there was no way to control it. I mean if you have 10 candidates and nine out of 10 raise their hand and say I'm going to any two hour block offered, well then you have a debate every three days and you're the only show in town," he told CBS News' "Face the Nation" in 2013. "So while we were playing footsie debating each other 23 times what was the other side doing? They were spending potentially hundreds of millions of dollars on data, technology, voter outreach. They were actually getting the job done." The RNC has authorized nine debates thus far this cycle, and party officials have vowed to penalize any candidate who participates in an unsanctioned debate.